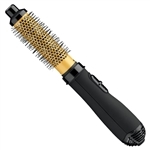 The ConairPRO Porcelain Series Soft Bristle Hot Air Brush with a 1 1/4" ceramic barrel styles and dries hair simultaneously. Use it to create volume, texture, curl, or smooth and straighten. The unique non-stick ceramic barrel technology evenly spreads maximum heat transfer for faster styling.Ceramic technology eliminates frizz and emits negative ion reflective's which enhance the vitality of the hair. With 1000 watts of power and two heat settings, it is perfect for all hair types. Features include two heat settings that allow the iron to heat up to 446°F. A 360° and swivel professional power cord prevents the cord from getting tangled or damaged. Get soft, beautiful curls quickly and easily. This ceramic hairsetter features 12 velvety flocked jumbo rollers (1½") that heat up quickly and efficiently. The ceramic core provides maximum heat transfer to let you create quick and even waves and curls for your clients. 12 butterfly clips and 12 color-coded metal clips are included. The color-change sensor on roller tip lets you know when rollers are ready. Babyliss Pro Nano Titanium 12 Jumbo Roller Hairsetter has 12 jumbo velvety flocked rollers with 12 butterfly clips and 12 metal clips. Nano Titanium Ceramic core generates gentle, far-infrared heat to eliminate damaging hotspots and leave hair looking healthy. Get soft, beautiful curls quickly and easily. Velvety flocked rollers feature a ceramic core which generates infrared heat for faster styling. Ultra fast heat up. Includes 20 velvety flocked rollers (6 small, 6 medium, 8 large). 20 super clips and 20 color-coded metal clips. Ultra-fast heat up. On/off switch with indicator light. Give your hair a frizz-free boost with the revolutionary new Root Boost from BaByliss. This innovative micro crimper makes it easy to add texture and lift to your hair for volume that lasts longer than back combing, while also saving your hair from becoming an unmanageable frizzy mess. Inspired by salon hairdressers, the Root Boost takes advantage of the long-lasting effects of crimping. However, it is entirely unlike other crimpers. Its specially designed micro crimping ceramic plates allow you to crimp close to the root of the hair where ordinary crimpers struggle to reach. The result is a more effective "boost" where it is needed most for a big hair look that lasts longer than ever. Unlike ordinary crimpers which crimp a wide section of the hair, the ultra sleek Root Boost creates a narrow crimp that is less visible, meaning it is unlikely anyone will discover your secret to voluminous style. Designed with slim micro crimp plates that are only 15 mm wide, the Root Boost allows you to texturise and volumise your hair right from the root, giving your hair the boost it needs to stay full all day long. Depending on your hair type, set the slim ceramic heating plates to one of the three temperatures--140°C, 170°C or 200°C. If you have delicate, fine or coloured hair, use the lower heat setting. For thicker hair, use the higher heat setting. Once the Root Boost has reached the desired temperature, it is simply a matter of sectioning your hair and adding texture to each layer for that full volume look you love. After only a few seconds of crimping, each section of hair that has been treated by the Root Boost will have volume and lift which lasts longer than back combing and avoids giving your hair messy frizz. The Root Boost puts a professional styling technique right in your hands. Professional salon hairdressers use crimpers to give their celebrity clients the big hair look that we all love. For ultimate hold and lift, use hairspray at the root of each hair section before using the Root Boost. For maximum body and fullness, start by sectioning a small layer of hair at the nape of the neck and begin crimping the hair close to the root, continue around the hair line of the section. Continue releasing sections of hair down and adding texture at the roots until you have the level of volume you want. The top section of your hair should be styled as normal, so be careful not to crimp hair too close to the top section as crimp marks maybe visible on your final style. The Root Boost lets you control your hair as if you were a salon hairdresser. Its 2 metre salon style swivel cord moves as you move, so you can avoid getting caught up in a cord as you style and volumise your hair. For even more convenience and control, the Root Boost features an on/off button. It also has an automatic shut off feature. This automatically switches the Root Boost off if it has been on for more than 72 minutes, continuously. Babyliss Pro Nano Titanium 20 roller hairsetter generates gentle, far-infrared heat to eliminate damaging hotspots and leave hair looking healthy. This set includes 20 velvety flocked rollers, 20 butterfly clips, and 20 color-coded metal clips – everything you need to make styling easy. Get soft, beautiful curls quickly and easily. Velvety flocked rollers feature a ceramic core which generates infrared heat for faster styling. Ultra fast heat up. Includes 30 tangle-free rollers (4 sizes) with stay-cool ribbed ends and 15 super clips with handy storage pouch. 2 professional temperature settings. Snap-on lid for easy storage. Sizes: 8 Jumbo (1-1/2"), 8 Jumbo (1-1/4"), 8 Jumbo (1") & 6 Small (3/4").